Drugstores are the one retail sector to show consistent growth over the past decade. It is fast becoming a key channel for mass market cosmetics, health and medical supplies, as well as all types of foods, with some chains now already selling enough food to qualify as top 20 supermarkets. Drugstores already own close to a 40% share in cosmetics. With massive consolidation in the sector, leading chains are looking for ways to differentiate their ranges and add value, making them an increasingly vital channel for imported brands. Stripe International has tied with Softbank to open the latest online fashion mall in Japan, Stripe Department. The new mall positions itself at the premium end of the market, hence the name, creating for the first time an online mall with a very distinct positioning. There’s lots of reasons why it could be a hit. Editorial: Amazon: Japan’s 3rd biggest retailer? Charles & Keith is a successful bags and footwear retailer selling good design at low prices, a formula that should give it a chance in the Japanese market considering the paucity of major local chains in these categories. Unfortunately, it signed with Onward Holdings for its first attempt but, fortunately, it cancelled this arrangement and will now go it alone. Competition is intensifying among online malls, and those with lower traffic are being forced to reduce fees to ensure sufficient numbers of leading merchants sell through them. KDDI, which is making a play for a major share of the mobile e-commerce market, is the latest. Ebay has tried to take on the Japanese market before, but is trying again through an acquisition, Qoo10, a business it helped set up. It will fund Qoo10’s expansion, but also use the online mall to feed selected merchandise from other Ebay markets. Japan’s largest discount retailer continues to go from strength to strength. 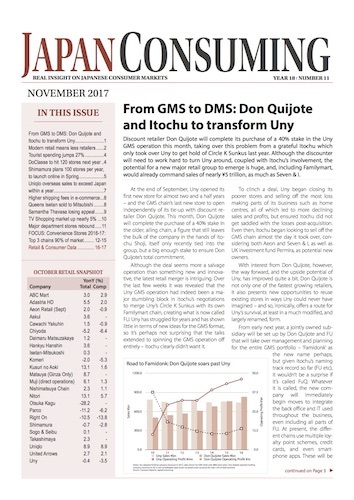 Having acquired a 40% stake in the Uny GMS chain last November, Don Quijote is now expecting better results than previously forecast, and the first six experimental Uny-Donki hybrids will all open by the end of this month. With Yamato pushing up courier fees by around 40%, and increasing pressure on wages in the logistics industry, it was only a matter of time before Amazon decided it needed to pass on some of this cost to its merchants. Meanwhile sales hit another record. Senshukai is giving up on a two-year agreement to build a joint omnichannel system with department store operator J Front Retailing. Despite investment from J Front, Senshukai has made little progress and now plans to go it alone, buying back most or possibly all of the stake held by the larger partner. Seven & I acquired Sogo Seibu in 2006, thinking the department store would help broaden the conglomerate’s portfolio. It set out to centralise store operations, and in 2009 introduced a new, high-end private brand programme, including collaborations with designers like Karl Lagerfeld and Jean-Paul Gaultier. In February that programme was cancelled unexpectedly. The good news is that Sogo Seibu will fill the space with more select shop style retailing, providing opportunities for overseas brands. The suit market will contract as the number of retirees reaches its peak in the next few years, but Aoyama Shoji, which is already far ahead of rivals in the business apparel market, expects to add another ¥50 billion in sales in the next few years. Most of this will come from new ideas, in particular a redefinition of just what business attire is. February saw the usual round of new announcements from the top convenience store chains. Last month included trials for new RFID systems, the latest refresh of the increasingly important coffee ranges, and highway locations for Seven Eleven. Lawson, meanwhile, has finally announced plans to retire the HMV brand. Start Today launched a fashion subscription service last month that promises to use the online fashion firm’s vast mine of data to provide customers with automated fashion top-ups every month. The new Start Today Research business will deepen data capture and analysis to map Japanese fashion trends and preferences, and develop products to match. Five years ago, many pundits wrote off Muji’s chances of expanding much further at home when its sales stood at ¥188 billion, citing concerns about saturation and an ageing brand and customer base. Today it turns over more than ¥333 billion and has plenty of life left in it both at home and abroad. While it has kept pace with new trends in merchandising and retailing, it is its relentless exploitation of new technologies to deepen communication with customers that best expresses Muji’s ability to renew itself.